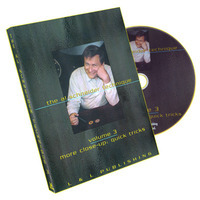 Today, when you order "More Close-Up Quick Tricks: Volume Three by Al Schneider - DVD", you'll instantly be emailed a Penguin Magic gift certificate. You can spend it on anything you like at Penguin, just like cash. Just complete your order as normal, and within seconds you'll get an email with your gift certificate. This is an excellent DVD. The tricks are not blockbusters, but they are all very entertaining and only slightly more advanced than beginners magic. There are no less than 18 tricks on this DVD and only about 4 or 5 require an item that must be purchased from a magic shop. Everyone into magic, amateur, pro or absolute newby will get something out of this material.